Post: Gaurav Akrani. Date: 6/01/2010. Comments (4). Label: Education, Management, Study Notes. 1. 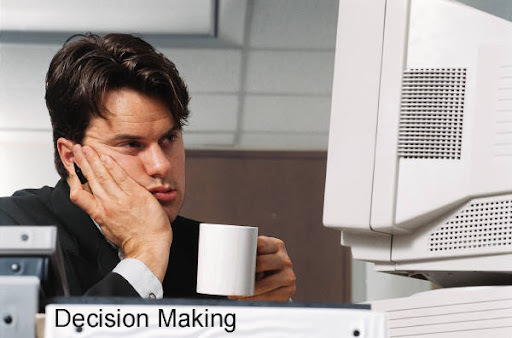 What is Decision Making? Decision-making is an essential aspect of modern management. It is a primary function of management. A manager's major job is sound/rational decision-making. He takes hundreds of decisions consciously and subconsciously. Decision-making is the key part of manager's activities. Decisions are important as they determine both managerial and organizational actions. A decision may be defined as "a course of action which is consciously chosen from among a set of alternatives to achieve a desired result." It represents a well-balanced judgment and a commitment to action. It is rightly said that the first important function of management is to take decisions on problems and situations. Decision-making pervades all managerial actions. It is a continuous process. Decision-making is an indispensable component of the management process itself. Means and ends are linked together through decision-making. To decide means to come to some definite conclusion for follow-up action. Decision is a choice from among a set of alternatives. The word 'decision' is derived from the Latin words de ciso which means 'a cutting away or a cutting off or in a practical sense' to come to a conclusion. Decisions are made to achieve goals through suitable follow-up actions. 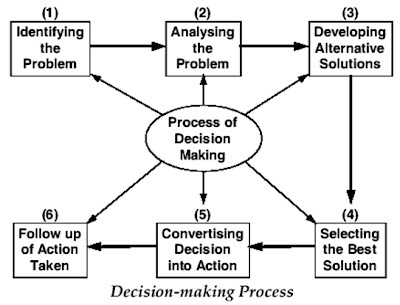 Decision-making is a process by which a decision (course of action) is taken. Decision-making lies embedded in the process of management. According to Peter Drucker, "Whatever a manager does, he does through decision-making". A manager has to take a decision before acting or before preparing a plan for execution. Moreover, his ability is very often judged by the quality of decisions he takes. Thus, management is always a decision-making process. It is a part of every managerial function. This is because action is not possible unless a firm decision is taken about a business problem or situation. This clearly suggests that decision-making is necessary in planning, organising, directing, controlling and staffing. For example, in planning alternative plans are prepared to meet different possible situations. Out of such alternative plans, the best one (i.e., plan which most appropriate under the available business environment) is to be selected. Here, the planner has to take correct decision. This suggests that decision-making is the core of planning function. In the same way, decisions are required to be taken while performing other functions of management such as organising, directing, staffing, etc. This suggests the importance of decision-making in the whole process of management. The effectiveness of management depends on the quality of decision-making. In this sense, management is rightly described as decision-making process. According to R. C. Davis, "management is a decision-making process." Decision-making is an intellectual process which involves selection of one course of action out of many alternatives. Decision-making will be followed by second function of management called planning. The other elements which follow planning are many such as organising, directing, coordinating, controlling and motivating. Decision-making has priority over planning function. According to Peter Drucker, it is the top management which is responsible for all strategic decisions such as the objectives of the business, capital expenditure decisions as well as such operating decisions as training of manpower and so on. Without such decisions, no action can take place and naturally the resources would remain idle and unproductive. The managerial decisions should be correct to the maximum extent possible. For this, scientific decision-making is essential. The Oxford Dictionary defines the term decision-making as "the action of carrying out or carrying into effect". 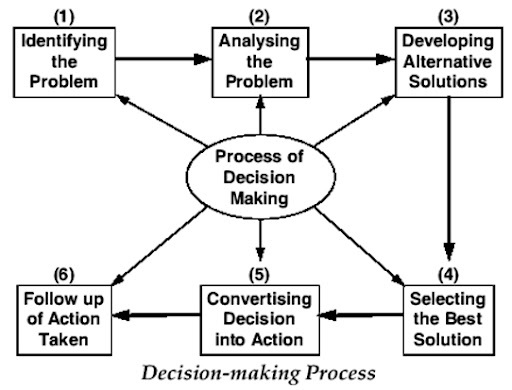 According to Trewatha & Newport, "Decision-making involves the selection of a course of action from among two or more possible alternatives in order to arrive at a solution for a given problem". Decision making implies choice: Decision making is choosing from among two or more alternative courses of action. Thus, it is the process of selection of one solution out of many available. For any business problem, alternative solutions are available. Managers have to consider these alternatives and select the best one for actual execution. Here, planners/ decision-makers have to consider the business environment available and select the promising alternative plan to deal with the business problem effectively. It is rightly said that "Decision-making is fundamentally choosing between the alternatives". In decision-making, various alternatives are to be considered critically and the best one is to be selected. Here, the available business environment also needs careful consideration. The alternative selected may be correct or may not be correct. This will be decided in the future, as per the results available from the decision already taken. In short, decision-making is fundamentally a process of choosing between the alternatives (two or more) available. Moreover, in the decision-making process, information is collected; alternative solutions are decided and considered critically in order to find out the best solution among the available. Every problem can be solved by different methods. These are the alternatives and a decision-maker has to select one alternative which he considers as most appropriate. This clearly suggests that decision-making is basically/fundamentally choosing between the alternatives. The alternatives may be two or more. Out of such alternatives, the most suitable is to be selected for actual use. The manager needs capacity to select the best alternative. The benefits of correct decision-making will be available only when the best alternative is selected for actual use. Continuous activity/process: Decision-making is a continuous and dynamic process. It pervades all organizational activity. Managers have to take decisions on various policy and administrative matters. It is a never ending activity in business management. Mental/intellectual activity: Decision-making is a mental as well as intellectual activity/process and requires knowledge, skills, experience and maturity on the part of decision-maker. It is essentially a human activity. Based on reliable information/feedback: Good decisions are always based on reliable information. The quality of decision-making at all levels of the Organisation can be improved with the support of an effective and efficient management information system (MIS). Goal oriented process: Decision-making aims at providing a solution to a given problem/ difficulty before a business enterprise. It is a goal-oriented process and provides solutions to problems faced by a business unit. Means and not the end: Decision-making is a means for solving a problem or for achieving a target/objective and not the end in itself. Relates to specific problem: Decision-making is not identical with problem solving but it has its roots in a problem itself. Time-consuming activity: Decision-making is a time-consuming activity as various aspects need careful consideration before taking final decision. For decision makers, various steps are required to be completed. This makes decision-making a time consuming activity. Needs effective communication: Decision-taken needs to be communicated to all concerned parties for suitable follow-up actions. Decisions taken will remain on paper if they are not communicated to concerned persons. Following actions will not be possible in the absence of effective communication. Pervasive process: Decision-making process is all pervasive. This means managers working at all levels have to take decisions on matters within their jurisdiction. Responsible job: Decision-making is a responsible job as wrong decisions prove to be too costly to the Organisation. Decision-makers should be matured, experienced, knowledgeable and rational in their approach. Decision-making need not be treated as routing and casual activity. It is a delicate and responsible job. Decision making is the primary function of management: The functions of management starts only when the top-level management takes strategic decisions. Without decisions, actions will not be possible and the resources will not be put to use. Thus decision-making is the primary function of management. Decision-making facilitates the entire management process: Decision-making creates proper background for the first management activity called planning. Planning gives concrete shape to broad decisions about business objectives taken by the top-level management. In addition, decision-making is necessary while conducting other management functions such as organising, staffing, coordinating and communicating. Decision-making is a continuous managerial function: Managers working at all levels will have to take decisions as regards the functions assigned to them. Continuous decision making is a must in the case of all managers/executives. Follow-up actions are not possible unless decisions are taken. Decision-making is essential to face new problems and challenges: Decisions are required to be taken regularly as new problems, difficulties and challenges develop before a business enterprise. This may be due to changes in the external environment. New products may come in the market, new competitors may enter the market and government policies may change. All this leads to change in the environment around the business unit. Such change leads to new problems and new decisions are needed. Decision-making is a delicate and responsible job: Managers have to take quick and correct decisions while discharging their duties. In fact, they are paid for their skill, maturity and capacity of decision-making. Management activities are possible only when suitable decisions are taken. Correct decisions provide opportunities of growth while wrong decisions lead to loss and instability to a business unit. Identifying the Problem: Identification of the real problem before a business enterprise is the first step in the process of decision-making. It is rightly said that a problem well-defined is a problem half-solved. Information relevant to the problem should be gathered so that critical analysis of the problem is possible. This is how the problem can be diagnosed. Clear distinction should be made between the problem and the symptoms which may cloud the real issue. In brief, the manager should search the 'critical factor' at work. It is the point at which the choice applies. Similarly, while diagnosing the real problem the manager should consider causes and find out whether they are controllable or uncontrollable. Collecting Relevant Data: After defining the problem and analyzing its nature, the next step is to obtain the relevant information/ data about it. There is information flood in the business world due to new developments in the field of information technology. All available information should be utilised fully for analysis of the problem. This brings clarity to all aspects of the problem. Developing Alternative Solutions: After the problem has been defined, diagnosed on the basis of relevant information, the manager has to determine available alternative courses of action that could be used to solve the problem at hand. Only realistic alternatives should be considered. It is equally important to take into account time and cost constraints and psychological barriers that will restrict that number of alternatives. If necessary, group participation techniques may be used while developing alternative solutions as depending on one solution is undesirable. Selecting the Best Solution: After preparing alternative solutions, the next step in the decision-making process is to select an alternative that seems to be most rational for solving the problem. The alternative thus selected must be communicated to those who are likely to be affected by it. Acceptance of the decision by group members is always desirable and useful for its effective implementation. Converting Decision into Action: After the selection of the best decision, the next step is to convert the selected decision into an effective action. Without such action, the decision will remain merely a declaration of good intentions. Here, the manager has to convert 'his decision into 'their decision' through his leadership. For this, the subordinates should be taken in confidence and they should be convinced about the correctness of the decision. Thereafter, the manager has to take follow-up steps for the execution of decision taken. Ensuring Feedback: Feedback is the last step in the decision-making process. Here, the manager has to make built-in arrangements to ensure feedback for continuously testing actual developments against the expectations. It is like checking the effectiveness of follow-up measures. Feedback is possible in the form of organised information, reports and personal observations. Feed back is necessary to decide whether the decision already taken should be continued or be modified in the light of changed conditions. Every step in the decision-making process is important and needs proper consideration by managers. This facilitates accurate decision-making. Even quantitative techniques such as CPM, PERT/OR, linear programming, etc. are useful for accurate decision-making. Decision-making is important as it facilitates entire management process. Management activities are just not possible without decision-making as it is an integral aspect of management process itself. However, the quality of decision-making should be always superior as faulty/irrational decisions are always dangerous. Various advantages of decision-making (already explained) are easily 'available when the entire decision-making process is followed properly. Decisions are frequently needed in the management process. However, such decisions should be appropriate, timely and rational. Faulty and hasty decisions are wrong and even dangerous. This clearly suggests that various advantages of decision-making are available only when scientific decisions are taken by following the procedure of decision-making in an appropriate manner. Identification of a wide range of alternative courses of action i.e., decisions. This provides wide choice for the selection of suitable decision for follow-up actions. A careful consideration of the costs and risks of both positive and negative consequences that could follow from each alternation. Efforts should be made to search for new information relevant to further evaluation of the alternatives. This is necessary as the quality of decision depends on the quality of information used in the decision-making process. Re-examination of the positive and negative effects of all known alternatives before making a final selection. Arrangements should be made for implementing the chosen course of action including contingency plans in the event that various known risks were actually to occur. Efforts should be made to introduce creativity and rationality in the final decision taken. 6. Why Rational and Right Decisions Are Not Possible? Rational decisions are the best decisions under the available circumstances. All decisions should be rational as such decisions facilitate expansion of business and give more profit, goodwill and prosperity to a business unit. Rationality and decision-making are closely related concepts. Rationality principle is applicable to all types of decisions. All decisions (business, economic, social etc.) should be fair and rational. They should serve as examples over a long period. For such decisions, rational/scientific/balanced approach is essential while making decisions. In the absence of such approach, decisions are likely to be faulty and dangerous to the Organisation and also to all concerned parties. Rationality in decision-making is possible through human brain which has the ability to learn, think, analyze and relate complex facts and variables while arriving at a decision. A manager has to introduce rationality in his decision-making by using his skills, experience, knowledge and mental abilities. On some occasions, such rational and right decisions are not taken due to variety of possible reasons. It is also possible that the decision taken may be rational when taken but is treated as wrong/irrational/faulty because' the results available from the decision taken are not as expected/positive/encouraging. Rational decisions may not be possible when the approach of the decision-maker is casual and superficial. He may not be alert, careful and cautious while taking the decisions or he might not have followed the decision-making process in a scientific manner. In brief, all business decisions should be rational as far as possible as such rational decisions offer many benefits/advantages. However, rational decisions may not be taken on certain occasions. According to Herbert A. Simon, human beings are not always rational in the decisional process. 7. Reasons Why Rational and Right Decisions May Not Be Possible? Inadequate information, data and knowledge: For rational decision-making accurate, reliable and complete information about various aspects of the problem under investigation is necessary. The possible future trends can be estimated with the help of such information. This facilitates rational decision-making. However, adequate and reliable information may not be available at the time of decision-making. As a result, the decisions become defective or irrational. Such decision may prove to be faulty in the course of time. This is how the decisions become irrational to certain extent. Uncertain environment: Decisions are taken on the basis of information available about various environmental variables. However, the variables are many and complex in nature. They may be related to political, economic, social and other aspects. It is not possible to study all such variables in depth due to inadequate information/data. This leads to inaccuracy in decision making and the decisions taken are not fully rational. Limited capacity of decision-maker. A decision-maker should be expert, knowledgeable, intelligent and matured. He needs vision and capacity to imagine possible future situation. In the absence of such qualities, the decision-maker may not be able to take rational decisions. Similarly, the decision taken may not be rational if the decision-maker fails to follow all necessary steps required for scientific decision-making. A hasty decision or decision taken without full use of all mental faculties may not be fully rational. Thus, decisions are likely to be less rational if the decision maker lacks capacity to take rational decisions. Personal element in decision-making: Decision-making should be always impartial and also favorable to the Organisation. Decision against Organisation but favorable to decision maker or other employees will be unfair. Such decision will not be rational. Similarly, every decision-maker has his own personal background in the form of personal beliefs, attributes, preferences, likes and dislikes and so on. A decision-maker is expected to keep these elements away while taking management decisions. This may not be possible in the case of all decision-makers and on all occasions. However, decisions are not fully rational when such personal element comes in the picture. A decision cannot be fully independent: Managerial decisions are interlinked and interdependent. A manager has to make adjustments or compromises while making decisions. For example, for reducing price, some compromise with the quality may be necessary. A manager gives more importance to one and less to the other. He takes one decision which is rational at the same time makes some compromise in the other decision. As a result, other decision is not likely to be fully rational. In short, business decisions are interlinked. This brings an element of irrationality in some decisions. The points noted above suggest why it is not possible to take rational and right decisions on all occasions. There is close relationship between planning and decision-making. Decision-making has priority over planning function. It is the starting point of the whole management process. In fact, decision-making is a particular type of planning. A decision is a type of plan involving commitment to resources for achieving specific objective. According to Peter Drucker, it is the top management which is responsible for all strategic decisions such as the objectives of the business, capital expenditure decisions as well as operating decisions such as training of manpower and so on. Without management decisions, no action can take place and naturally the resources would remain idle and unproductive. The managerial decisions should be correct to the maximum extent possible. For this, scientific decision-making is essential. quite an interesting piece. a very good resource for both industry and academia. useful info. life saver for writing a paper at the last minute. Very useful information. I congratulate those that contributed for this wonderful package. This is lovely information. Keep up with the same spirit.